Screenshot of Manis news from the website of the Center for the Study of First Americans. Click to go to page. Quite a while ago I posted about some of the frustrations I felt about the Manis Mastodon site, near Sequim on the Olympic peninsula. This 1970s find of a Mastodon skeleton had one singularly enigmatic feature: there appeared to be the broken tip of a bone point embedded in one of its ribs. As I wrote before: yank that sucker out! – so we can determine for sure if this is a human made artifact dating to the same age as the Mastodon – about 14,000 years ago. Being well pre-Clovis and right near the coast, this find would be of profound importance to our archaeological understanding of the first arrival of people into the Americas. Now, as you can read above, there is an intriguing hint that Manis has finally been re-examined, and found to be a legitimate Pleistocene archaeological site. It’s real. Wow. Manis Mastodon rib with bone point protruding. Source: CSFA. Click for photo gallery. In 1973, a single mastodon was excavated on the Olympic Peninsula by Carl Gustavson [sic]. The mastodon remains were dated to about 14,000 years ago and the animal appeared to have been butchered by humans. No stone tools were found at the site, but one rib of the mastodon had a bone object embedded in it. Gustavson interpreted this to be a bone projectile point. For many years the evidence from this site has been debated. Using modern technologies-advanced AMS radiocarbon dating technology, high resolution X-ray CT imaging, and DNA and protein sequencing-we reanalyzed the evidence from the Manis site. 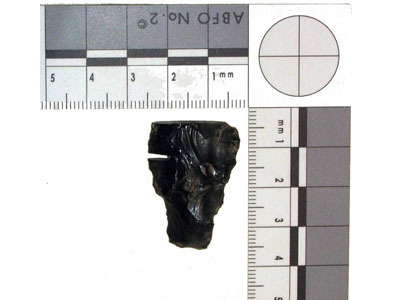 This reexamination shows that the object is a bone projectile point and that the site is 14,000 years old. This provides unequivocal evidence of pre-Clovis mastodon hunting at the close of the Ice Age. Now, I have not been able to find any other information on this. Presumably they have an article submitted to a peer-reviewed journal. Their language indicates they are very confident in the result though, and even the brief paragraphs suggests that a rigorous and multi-faceted analysis was undertaken. I emailed the center a week or so ago, but haven’t heard back yet – but then, neither did they yank the posting! So lets consider it real for the time being. The implications are enormous. People were hunting Mastodon on the Northwest Coast some 1,000 years before Clovis – the purported first archaeological culture of the Americas. It’s a major game-changer in how we think about the first peopling of the Americas, and about the roots of NW Coast Archaeology and the ancient presence of First Nations people in the Salish Sea. 1. It makes the nearby Ayer Pond (Orcas Island) finds, thought to be a Bison antiquus butchered by humans some 13,700 years ago, seem even more likely to be real. While each site must stand alone as an independent archaeological claim, we can’t completely ignore the context that two sites from roughly the same time period do mutually reinforce each other’s plausibility, at least rhetorically. 3. The use of bone technology for megafauna hunting is interesting in its own right. We know bone points have superior qualities in some ways to stone ones: they are less brittle, and may be configured to be very narrow/sharp/cylindrical to offer less resistance to penetration, perhaps an advantage with such large animals – an ice pick to the heart which can slip between the ribs, so to speak. Without wanting to extrapolate too much, it’s at least worth pondering a low risk hunting strategy of aerial ambush with deeply penetrating weapons, followed by a long tracking process of a bleeding animal. In the case of Manis, the animal actually escaped and lived for another three or four months, according to veterinarians. But it would nonetheless be a good way to hunt, and stands in contrast to the kinds of images we usually have brought to mind: hunters bravely standing under a rearing mastodon, armed only with a spear, a loin cloth, and a callous disregard for their own safety. I’d be on the bluffs, myself. 4. The bone point also brings to mind the tip of a bone point found in Gaadu Din Cave 1, on Haida Gwaii, directly dated to about 11,900 years ago. The only plausible reason for this bone point to be in that cave was as part of a winter-time bear hunting practice. Again, organic technology was chosen for even the most demanding and risky tasks. Bone technology is good technology: let’s give it some respect, and analytical love too. 5. I’m kind of glad that I never did get a chance to yank the sucker out – I probably would have used a leatherman and messed the whole thing up. And maybe the lack of definitive analysis in the 1970s as was a good thing – there are more modern methods, better CT scans, smaller samples needed for carbon dating, new techniques in ancient protein and DNA analysis. But if it had been definitive in 1979, say, around the time Monte Verde was first being published, then we might have been saved a few decades of the dying roars of the Clovis First model, with benefits to archaeology generally and with a headstart on the Pleistocene archaeology of the west coast. Knowing there were people on the ancient landform breeds optimism and energy to go find their sites. A lot of work could have been done in the interim. But nonetheless – assuming this is real – there is no longer any excuse. We must put in place a co-ordinated, focused and interdisciplinary effort to find and excavate more sites of this age, dating to the great Time of Transformation as the last ice age came to an end. We could do this in Haida Gwaii, in the Dundas Group, the Central Coast, the Salish Sea – it doesn’t matter. It’s a target-rich environment! Pleistocene Archaeologists of the Northwest Coast: Start Your Engines! edit: a little more on Manis at this post. Manis rib undergoing CT scan in late 1970s. Source: CSFA. Click for photo gallery. Gustafson, Carl E.; Gilbow, Delbert; Daugherty, Richard D. (1979). The Manis Mastodon Site: Early Man on the Olympic Peninsula. Canadian Journal of Archaeology, 3:157-164. Petersen, Kenneth L., Peter J. Mehringer Jr., and Carl E. Gustafson 1983. Late-glacial vegetation and climate at the Manis Mastodon site, Olympic Peninsula, Washington. Quaternary Research Volume 20, Issue 2, pp. 215 – 231. A short account of the find is here. Manis Mastodon at the Sequim Museum. This entry was posted in Archaeology, Northwest Coast, palaeontology, Washington State and tagged bone technology, clovis, first peopling, Manis, mastodons, pre-clovis, Sequim, zooarchaeology. Bookmark the permalink. Not sure if you have seen this, but they also reported (at least to the press) finding a wooden spear thrower at the Manis site (since it was a bog wet site); however it did not survive after they put it in a freezer (mistake!). Must be pictures of it out there somewhere? I will check around, and report back to you. Assuming the claims are borne out, the 14,000 year date also makes Manis contemporary with Paisley Cave in central Oregon and its human coprolites. Hi Dale, Thanks for the lead on the atlatl. Funny how things lay dormant for a long while and then come out with a rush. You might be the person to ask a question of, actually: is this thesis from WSU about the Manis site? Gilbow, D. (Delbert) 1973. Inference of Human Activity from Faunal Remains.“ M.S. thesis, Washington State University, Pullman. Also, thanks for kind words about the blog, which has been dormant a lot lately for reasons you may know about – I keep thinking I want to update it regularly but I never seem to quite have the time/energy to do so. Maybe if I aim for once a week or something it’d get done. Quentin: Hope all is going well for you and family (including brothers) too! Yes Delbert was Gus’ field supervisor, so this thesis should include Manis. Gus once showed me all the evidence in his lab that he had compiled to make his case for human involvement at the site–which was substantial. Just too bad he has not published these findings. Yes hard to update the web when you are so busy too–I feel the same about NewsWARP.info. I need to check to see what was found on the Charlottes this summer–I believe your brother Al was up there? Hmm, I’ll have to track that one down. It’s not one of the ones WSU has put online, at least not yet. I think the Haida Gwaii trip was a big success and got some new intertidal features and data, plus a potpourri of other stuff. Not oriented to the early phases though. I’ll give my best to Becky and all, hope to see you up here one of these days. As you can see, it is labelled pre-Clovis and I had heard that Dennis had given talks discussing a pre-Clovis stemmed point from Paisley Cave. Do you know the scuttlebutt – is this the one? I trust the label on the image of the stemmed point. I too have heard Dennis’ talks and have talked with him about this but know no secret info – of course, if it was secret, I couldn’t tell you.. I do very much like the idea of pre-Clovis stemmed points. I agree with you about Paisley; despite the controversy I think it’s real. I also agree with Dale about this blog. Ken – if you did know secrets, I would expect you to post them anonymously, of course. There seems to be a tangible, current fluorescence of west coast late Pleistocene research that has torn through the edges of the proverbiable envelope. Keep it up, people. Stock with value this is. And burn that other dog tooth too, yank it out so to speak? Mad Dog – yes, that tooth is gnawing away at me too. Seriously though, it does seem to happen that when the mental dams break, there is a big rush of new data, or, as often, the new data is old data that has been hanging around. It does seem amazing that it took 30 years for someone to reanalyze Manis though – talk about the smoking gun sitting right under our nose the whole time. I called Sequim museum about 5 years ago and at that time they weren’t completely sure where the bone was – they thought probably at WSU. Regarding the angle of penetration of the projectile point – for the life of me I can’t remember (or find) the reference to an article Brian Hayden made us read in his 4th year theory class many moons ago, but it contained a dramatic 19th century ink illustration of a pygmy using an elaborate snare of weights and ropes to entrain a spear from overhead into a modern elephant. While the imagery of someone launching something – or themselves – onto the back of an Elephantidae (did you know the term Pachyderm is invalid now?) gets the imagination juices going, I don’t think it would be too hard for a skilled hunter to sneak up & thrust a spear into a mastodon’s back while it was lying down/rolling around. Or arcing a spear overhead … http://libweb5.princeton.edu/visual_materials/maps/websites/africa/livingstone/livingstone1-6.jpg. Here I am. It is not even 0500 yet, checking my mail. And WOW, here is Quentin’s note on the Manis mistery. I was there, saw the place, wondered and did not understand why someone did not (as Q suggested) pull the object right out for examination. Maybe as well that this was not done and that less intrusive technology was used. Bravo! Now waiting for the official paper. Thank you for sharing this new information, I sure would like to see any publications related to this. I would also ask the same question as Dale, concerning the atlatl; is there nothing left of it? I would be interested to see what kind of wood it was crafted from! Edgewater – you have the right instinct! Yank first, ask questions later! Kathleen – from memory (Damn Can Jrnl Arch. for not having all its backissues online), there were some simple flake tools found with the mastodon but it was hard to make clear stratigraphic association to them. Further, the pattern of the bones (?one whole side missing?) and some things like the broken/smashed and reversed skull were suggestive of human butchery (this, I take it, is the topic of Gilbow’s thesis, above, but is also briefly reviewed in the CJA article). The presence in the bog would be consistent with a paleoindian practice of hunting big game at waterholes. So the mastodon may well have survived the bone point attack and then been nailed a few months later at the waterhole. The atlatl is news to me – on the one hand it seems unlikely to be the sort of artifact to be lost, but then maybe it broke or got covered by 100 yards of gooey elephant offal. 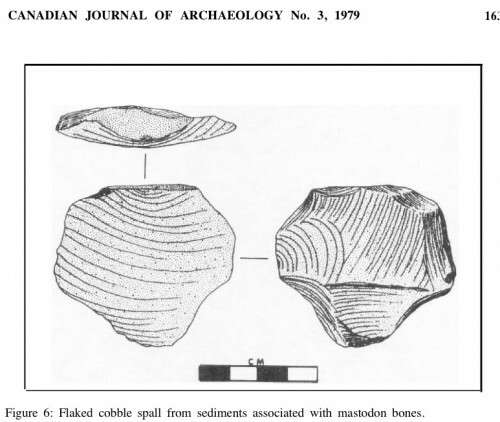 According to the 1979 article, a single cobble spall (which is illustrated in the article) was associated was found in sediments “associated with mastodon bones”. They mention other chipped and broken cobbles which were not definitively modified by humans. They also mention stones of sufficient size to break up elephant bones scattered across the landscape (of course, on a kame terrace, where, as they note there had been high velocity, short haul deposition of rocks). They also mention a concentration of bones and charcoal on higher ground that was going be explored in the ’79 field school. I assume that came to naught. Dale no doubt knows more about the history of that period at WSU than I do. They found the left side of the animal semi-articulated; some right side bones were found slightly north and unarticulated. They argue that the patterning of the bones at least conform (my words) to human butchery. Much of the animal was recovered through hydraulic sorting of Manis’ backdirt. THis is in CJA, 1979 3:157-164. The atl-atl is news to me, as well. It has always struck me as too bad that this wasn’t pursued with more vigor and I hope the folks at the Center in Texas have a paper submitted somewhere. Thanks for that, Ken. After three floods in two years in my office, I don’t have those paper copies around the way I might have. Not to mention I run this blog from my couch wearing pyjamas and sipping tea. Anyway, that conforms with my memory more or less, it didn’t seem fully convincing as reported and it was always likely to come down to the bone point itself. Which, you know, allows sidestepping all kinds of argument about stratigraphy and association and taphonomy and all the associated arguments and smokescreens and what-not – there’s not much better than a direct date on an unequivocal artifact if the goal is to set the goalposts. That’s why the Manis limbo has been so frustrating. I too really look forward to seeing a good paper from whoever has done this and hope it is as convincing as their confident web blurb makes it seem. Pajamas and tea on your couch, huh. I assume it’s a good Scotch tea. I’m responding fully clothed from my platform rocker with a single malt. When I visited the Manis Site, the stone flake/cobble tools were attributed by Gus to be Olcott-like assemblages in the 8000-9000 BP age range. The mastodon bones were from a more distinct provenience at greater depth, in the 12,000-13,000 radiocarbon (your 14,000 year age) year age range. The piling/stacking/positioning of the mastodon bones, indeed, as Ken has said, was the strongest suggestion of human involvement, but the bones evidently did not bear ‘cut’ markings that would indicate intensive processing, and the absence of cobble chopping and flake tools is in my mind conspicuous. My own view of the “bone point” embedded in the mastodon rib was that it was more likely a wound caused by the defensive maneuver of a Pleistocene elk. My final judgment awaits the more detailed study by CT scan or removal from the rib — It remains to be seen that the imbedded bone tip is a formed artifact or an antler tip. The wound to the mastodon clearly was not immediately fatal, so the argument for human involvement in processing the bones, in my mind, remains speculative and tenuous. I agree with Dale that more theoretical thinking needs to done, and that Alex Krieger’s concept of a Pre-Projectile Point (stone) Stage needs to be revisited. Also, we should not overlook the ideas of key colleagues who long ago argued for antler, bone, and wood tools pre-dating more specialized lithic technologies, including Alan Bryan and Rob Bonnichsen. I, too, hope to learn more about the stemmed point associations at Paisely Caves, and the recent stemmed point/crescentic knive finds by Jon Erlandson from the Channel Islands in California. These finds all show a broader significance for the Windust complex in the Basin-Plateau areas that I am interested in. Ken – I confess, it was the Scotch tea – medicinal you understand – which turned into Thanksgiving long weekend up here. I agree with what you say more or less although given the evidence of healing around the wound then I think that a date on the mastodon itself would suffice – then the bone point becomes 12,000 BP +/- elephant, which looks nice on a table of dates. David Rice – Hi, and thanks for your comment and first-hand observation! We all have to wait for whatever report might be coming from this brief announcement. I think the position and orientation of the wound (apparently top of the back, pointing down) makes a defensive scenario less likely – the elephant would have had to have been on its side interacting somehow with elk. Less likely than being attacked by humans, getting a fairly superficial wound, and carrying on. On the other hand, the same animal getting attacked twice in six months seems like just plain bad luck – so the probabilities go both ways. The mastodon seems to have been lying on its left side at the time of death, its head to the east and its tail to the west. The skull was rotated 180o facing west toward the posterior end, and was highly fragmented – more than 4000 fragments have been recovered to date. Since no “natural” processes can be invoked to account for the condition of the skull, we assume that man was responsible for rotating and perhaps crushing it. Bones from the right side of the animal (which should have been upper-most) were not recovered in the excavations encompassing the main carcass area. It appears that the parts of the carcass representing the right side were butchered more completely and moved some distance away from the main carcass. Some of these bones were encountered a short distance (less than 2 m) to the north. They were scattered and showed no evidence of articulation. The bones of the right side were often broken and exhibited numerous cuts and scratches as evidence of butchering (Figure 5). Except where bones were piled one on another, these elements from the right side had been deposited on the glacial drift surface upslope, and subsequently buried by the brown alluvium. Apparently the mastodon had died or was killed and was butchered shortly after glacial ice had retreated locally and before renewed deposition of alluvial material. And a picture of the single cobble-spall found “in association” with the mastodon: it looks like a real artifact to me though nothing compares to seeing it in real life, and the association to mastodon is the key issue at hand. A single, flaked cobble spall represents the only recognizable stone artifact found in association with the mastodon bones (Figure 6). Although many of the other larger cobbles have been chipped and broken, none can be shown definitely to have been altered by man. Stones of sufficient size, shape and hardness to break bones or smash tendons and ligaments of a mastodon were strewn all across the recently deglaciated landscape. Use of such cobbles in butchering would not necessarily result in apparent wear nor in alterations significantly different from “natural’’ alterations. Regarding the Manis site cobble spall flake association, can you imagine the amount of edge ware would be produced from processing a mastodon! If that is how the spall was used, then I think the edge polish would be pronounced. That was certainly true for many of the cobble spall knives that we found at DjRi3 (Milliken Site), and what I have found since then at Columbia Basin sites. Of course, I may be in error by ascribing such a function for the cobble spall in question. Also, Bonnichsen’s mammonth bone taphonomy studies would be a some variance with the CJA article with respect to use of available cobbles as hammer stones at the site. Analysis of the bone fractures, not necessarily wear on the cobbles, would reveal the tell-tale evidence of their use. Thanks for a thoughtful discussion! I agree that in principle the taphonomy of the bones alone could or should tell the story – and indeed that seems to be the conclusion of the Master’s thesis which has been sadly under-cited it would seem (and without having seen it, maybe there is reason, I really don’t know). A single spall tool does seem an inadequate stone assemblage, I would agree, though I did work on a giant sloth site on the Pampas which had only five flakes and a broken fish tail point – but then, the Pampas is a giant pile of dirt and rock is at an extreme premium. Not the case here. as for use-wear – well, maybe someone should find the spall tool and give it a look over! The great thing about Manis though is that it has the potential to be conclusive based only on the rib and the bone object. No arguments about taphonomy, breakage, association, stone tools, use wear, etc. The bone is its own discrete package of evidence. Also, I never knew you worked at Milliken! Yes, Quentin, three summers at Milliken with Borden, and part of one summer with Mitchell at Montague Harbor. Those were good times! A reminder that (annoyingly), WSU gives all their online files the same name “ARI” and there is no file extension – or – for some reason the extension may not persist during the download. Therefore you MAY need to save it with an explicit file name and manually add .PDF , or, change the name and extension after you download it. (and check out the “related items” at the bottom of that page for more). When I look at the image of that of that flaked cobbles spall I imagine holding it in my hand. At 4 cm it is barely larger than a grade-A large chicken egg. What would one do with that aginst mastodon bones? Unless of course there were large chunks of bone knocked off with larger stones, modified or not. Where are they?What evidence of impact of stones is there on the bones? Assuming those bones are stilll somewhere in a cardboard box. Another question: Where did the folks who presumably didt he butchering live? Would they have been nomadic, scavengers that camped close by the kill or the dead meat they came upon? Did they have temporary camps. If they did, where woulkdmtheyhave been located? What was the sea level like in the Sequim area at the time? encampmnets? Can anyone fill me in here please? As I’ve noted in another comment, the bones should tell their own story and I would expect some sort of evidence on them of human activity. I think it is only about 5% (just going on memory) of a large animal’s bones will actually (typically) show cut marks from stone tools after butchery. But there is often substantial deliberate breakage to get at marrow, and this is often very characteristic. Gustafson et al. note the displacement of certain body parts and the crushing and reorientation of the skull – but not enough detail is given to evaluate. The evidence at the nearby Ayer Pond site (linked way up) shows that human agency can be very convincingly deduced from bones alone at some sites; whether this is the case at Manis is perhaps an open question still. Regarding where the hunters camped, etc – we know so little about this time period. Ayer Pond and Manis is it for this millennium! But I would suspect they were mobile, mixed-marine/terrestrial hunters and gatherers, who would have been able to range widely across the then-open landscape in a way that forest infill perhaps discouraged. Sea level – the current dates on Manis are about 11,900 radiocarbon years ago. At this time, according to Fedje et al 2009, sea level in the Gulf Islands had just fallen over the previous 500 years from about 75 metres above modern to modern levels, and was about to go lower than today. So, sea level may have been (briefly) close to modern. But the Gulf Islands may not share the same exact history as Sequim which is on the lower flanks of the Olympics and might be expected to have more depression from isostasy. I don’t know offhand of any early sea level data from that side of the Strait of Juan de Fuca. The Manis site is at 165 metres above sea level, so surely sea level was lower than that! Sorry about all the typos in my previous message. I guess this is the sort of place where you have to get it right the first time! I can’t help but look at that scanning equipment image and wonder what music the rib asked to be played during the scan. Probably Wagner? The cascade of evidence of pre-Clovis sites still seems more of a trickle to me, with the sites with great stratification and dates and poop lacking artifacts, or sites with great artifacts lacking bulletproof dating, or some other critical component missing from each one. Thanks to David Rice for pointing out the alternate hypotheses regarding Manis. If the new imaging shows that its a barbed bone/antler point rather than an amorphous pointy bit, I’ll be convinced. Why can’t any of these well-dated objects be clearly cultural? l, At the risk of offending the illustrator, who probably reads this blog) The Manis flaked cobble spall drawing is terrible and doesn’t show flaking details properly; if its stratigraphically from a much later component, it shouldn’t be part of the discussion. Reading through the Center for Study of First Americans project list on their website is impressive – they’ve certainly targeted both great new sites to dig at and clever reassessments of old research. And their debunking of many of the pre-Clovis contenders is reassuring. That picture of the nearly microscopic two-strand thread from Paisley Cave reminded me of the one from the 10K rcybp wetsite on Haida Gwaii. Incidentally, my spies tell me that the new Manis paper is coming out in a prestigious journal next week. So all will be revealed, and soon. Should be fascinating. Morley, there are important differences between the cordage at Paisly Cave and the 9,450 RCYBP Kilgii Gwaay cordage from Haida Gwaii. The Kilgii cordage is braided, not twisted, it is 3 strand, not 2 strand. It includes one strand of what is probably grass (like one of the Paisley cords which is described as grass) and two strands of softwood root. The probablegrass strand was visible as a different yellowish colour on excavation, the other two strands were darker. Each strand was 1mm x 1.5mm and the cord itself was 1mm x 3mm in cross section which is quite a bit larger than much of the Paisley cordage/thread appears to be. However, you are right that there are broad similarities – very old sites with sophisticated fine cordage or thread suggestive of a highly developed, fibre based, composite artifact technology. There is every reason to expect fine basketry and complex clothing to have been present at that time as well. qmackie – great news that the Manis paper will be out so soon. We look forward to your digest of it, as well as reading the article itself when we can get our mitts on it. Thanks APM for correction regarding braided bit at Kilgii Gwaay, but also dates are 9,450 to 9,400 RCYBP or 10,680 to 10,620 calendar. The cordage is itself not directly dated but pretty tight dates anyways. One more thing, re: somewhere in this thread, why would an elk attack a mastadon? Not likely even in rut, I’m thinking. Mad Dog – it’s also slightly maddening that after this time it hasn’t been definitely said if it is a bone or antler. If it is bone, then it reduces the options quite a bit for how it got there – I mean, you’d have to be an elk rutting pretty damn hard to leave a bone inside a mastodon (no double entendres please). And distinguishing bone from antler should be possible with a hand lens. I think I mentioned it in one of the threads (so many posts now – just made #302!) but noted zooarchaeologist Donald Grayson repeatedly refers to it as a “bone” in a 2002 review (cite below) in which he concludes we don’t know enough to say if it is cultural or not. Bone vs Antler should be distinguishable with a hand lens to an experienced practitioner. Did he look at it? Grayson and the bone are both in Washington! Grayson also takes credit in that article for arranging the CT scan of the item. I wonder if he actually held the item in his hand at any point and was able to say for sure if it was bone. It seems remarkable again that this find was on the radar of a prominent zooarchaeologist with an interest in the peopling of the Americas and indeed an interest in proboscideans, and yet after a brief consideration it apparently went back into the drawer, or under the radar at least. I know I keep saying it, but holy cow, over 30 years and finally someone is doing the equivalent of yanking it out and settling this issue once and for all. How many close calls over the years were there in settling this thing, and how much difference would it have made if it had been settled in 1985 or 1995 instead of 2011. Lots of grief avoided and a head start maybe on number next: the Pleistocene Archaeology of the Salish Sea. In the article they also dismiss the spall tool on the basis of poor association and maybe not even an artifact. Check out this space tomorrow afternoon, there might be some news about Manis at that point. 1. The bone in the rib looks like a splinter. 2. The mastodon may have impaled himself, near an elephant graveyard, on an isolated protruding bone of another mastodon or may have had a piece of one of his own bones driven into him by another mastodon. 3. Why “pincushion,” with precious bone-tipped foreshafts and spearshafts, an old mastodon that is upright or on his side while “stuck in the muck”? Just wait until he founders and butcher him. 4. If he was pincushioned before he got stuck, how do you explain only a single bone “spearpoint” in the back? If he was shot, say beneath a cutbank, he got away because the so-called “wound,” showed signs of healing. 5. The X-rays, which I took to the elephant expert at UC-Davis years ago, showed “slight healing” and “no signs of infection that would be expected if the mastodon was shot with a spearpoint made of the bone of a different species and then survived for many days.” There was no time for healing if he was shot in the back while stuck in the muck. Thanks for your comment. I’m not the right person to defend in detail this claim but I’ll give it a go. It occurs to me you may not have seen the updates to this story, see the edit at the very top. — perhaps. A pointed splinter. The pieces of which can be reconstructed into a viable bone point of a kind known from from the later Pleistocene of North America. See the Water’s video. –The DNA showed this was a different mastodon. I think we might want to start here with Occam’s razor: which is most likely – impalement by accident on a mastodon bone fragment in the middle of the back only achievable by rolling over on top of a firmly positioned long, narrow mastodon bone splinter with sufficient force to penetrate 25 cm of meat and several cm of bone, or, being attacked by people with hunting technology known worldwide at that time? –I don’t understand the “pincushion” claim. There’s only evidence for one impact. There may have been more, or maybe not. In any case, what is more precious? A few tons of meat/hide/bone, or a few bone projectiles? No reason to think you wouldn’t get the foreshafts back, and other than the ones that break on bone (and even this one may only have lost a few centimetres of length) you might not even damage them. 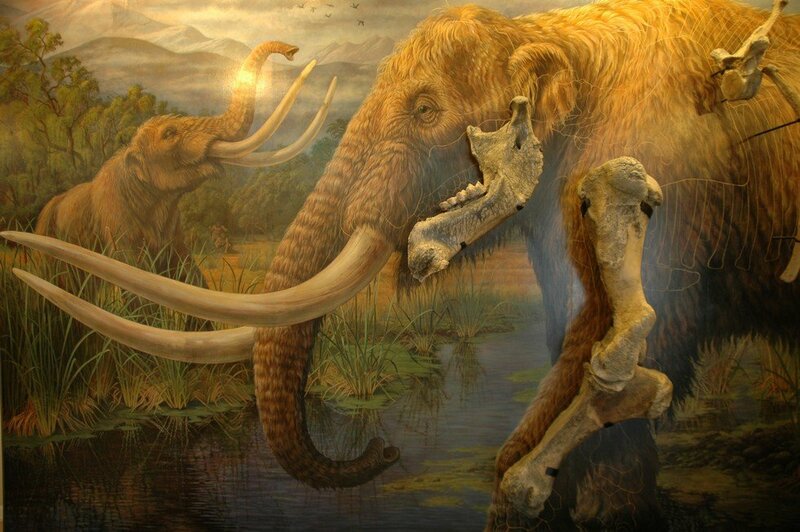 In any case, do you think mastodons or mammoth were ever killed by spears? Because this calculus would apply across the board to all megafaunal kill sites. Indeed, people used elaborate, much more labour intensive projectile points on smaller game, like composite toggling harpoon heads/lanyards/floats/foreshafts used for hunting seals. –According to the new analysis, there is no sign of healing. The eruptive material is the shattered end shaft of the bone point. Also, there is no evidence he was pincushioned, or that he wasn’t. Surely this wasn’t a fatal wound (but a few centimetres to either side and it may well have been) but it is perimortem, and a single deep shot to the lungs would be fatal. —The old x-rays are indeed inconclusive. The new high resolution industria CT scan is an order of magnitude more detailed. He was not shot with a different species. And there is no evidence of healing. –With present evidence, I think it probably is, though the site certainly lacks certain lines of evidence one would like to see, or a degree of full reporting that would be ideal. yet, the bone-in-bone is a kind of site unto itself, and can stand without a full contextual understanding, as Ken notes above. As scientists we have to keep reminding ourselves not to take in faith the conclusions of someone or some organization about a possible paradigm-changing archeological find, or any other, based on their credentials and/or past successes. The evidence, for all to see, must be presented with the conclusions. Otherwise, if they are repeated often enough and long enough, however cautiously at first, they tend to be taken as the “gospel truth” (think of the Bible and Piltdown Man). So where are the thorough descriptive reports for the Manis mastodon find that we all need for informed debate? They simply do not exist or, are at best, unavailable. It is professionally irresponsible, if not unethical, to (1) publish speculations or conclusions about an archeological find, knowing that they will probably be picked up and translated by the media as “fact” and (2) continue doing this until they are eventually published as such by otherwise reputable archeologists in books and on maps. This has been the case for the Manis mastodon find from the start–almost 40 years ago. You can add my name to the list of Northwest Coast People. I was for 18 years (1976-1994) the National Park Service archeogist, operating out of the Western Region in San Francisco, who was responsible for reviewing PacNW EIS’s and Section 8 Reports on National Historic Landmarks (like Fort Hall in Idaho) to determine whether Federal agency construction or permitted projects complied with historic preservation laws. Not only that, I did research and field work on several projects in Oregon, Washington, and Idaho and published reports or articles on the results. Although long retired, I remain interested in Pacific Northwest archeology.